Figure: The ATLAS measurement of the W boson mass is compared to the Standard Model prediction from the electroweak fit, and to the combined values measured at the LEP and Tevatron colliders. The W electroweak gauge boson was discovered in 1983 at the CERN SPS collider. Although the properties of the W boson have been studied for more than 30 years, precise measurement of its mass remains a major challenge. In the Standard Model of particle physics, the W mass is connected in particular to the top-quark and Higgs-boson masses. The measurement of the W mass tests this prediction and the self-consistency of the Standard Model. The effects of new physics at high-energy scales could cause a deviation of the measured value from precision fits to the Standard Model. The W mass had been measured at electron-positron and proton-antiproton colliders, yielding a combined world average of 80385±15 MeV, driven by the Tevatron collider results and consistent with the Standard Model constraints of 80358±8 MeV. The ATLAS collaboration is now reporting the first measurement of the W mass using LHC proton-proton collisions data at a centre-of-mass energy at 7 TeV and corresponding to an integrated luminosity of 4.6 fb-1. The measured value is 80370±19 MeV, consistent with the Standard Model prediction. It is also consistent with the combined values measured at the LEP and Tevatron colliders, and with the world average (see figure). The ATLAS result matches the best single-experiment measurement of the W mass performed by the CDF collaboration. 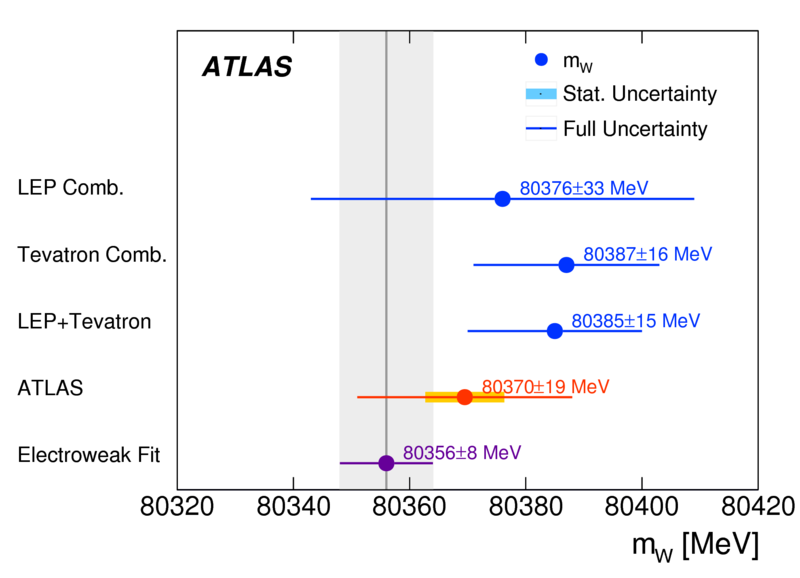 The ATLAS collaboration is now reporting the first measurement of the W mass using LHC proton-proton collisions data at a centre-of-mass energy at 7 TeV. The ATLAS result matches the best single-experiment measurement of the W mass performed by the CDF collaboration. Measuring the W mass is particularly challenging at the LHC, in comparison to LEP and Tevatron. This is due to the large number of interactions per beam crossing and to the significant contributions of second-generation quarks (strange and charm) to W production. The W mass was measured by ATLAS using W boson leptonic decays into an electron or muon and a neutrino, by reconstructing the kinematic properties of the decay leptons in the final state. The measurement required an accurate calibration of the detector response. Using LEP’s precisely measured value of the Z boson mass, the large sample of Z boson events allowed ATLAS to measure the electron-energy and muon-momentum scales with a relative accuracy of 10-4. The reconstruction of the transverse momentum of the neutrino relies on the precise measurement of the hadronic activity recoiling against the W boson. The recoil response was calibrated with Z boson events by exploiting the expected momentum balance between the recoil and the Z decay products. Accurate predictions of the W boson production and decay are crucial for the W mass measurement in proton-proton collisions. The enhanced amount of heavy-quark-initiated production, and the ratio of valence and sea quarks in the proton, affect the W boson transverse momentum distribution and its polarisation. The mass measurement is thus particularly sensitive to the parton distribution functions of the proton. To address these issues, ATLAS developed innovative techniques, which combine the most advanced theoretical predictions with experimental constraints from precise measurements of Z and W boson differential cross sections and of Z boson transverse momentum and polarisation. Future analysis of larger data samples at the LHC would allow the reduction of the statistical uncertainty and of several experimental systematic uncertainties. Finally, a better knowledge of the parton distribution functions, and improved QCD and electroweak predictions of W and Z boson production are crucial for further reducing the theoretical uncertainties.